Farmers and gardeners in cold regions have always looked for ways to preserve their harvest, from root cellars to pickling crocks to canning jars. But what if it were possible to grow cold-hardy vegetables over the winter? There are many Cheyenne gardeners extending the growing season using cheap and easily available building materials to build hoop houses, also known as high tunnels. If you’ve ever thrown an old sheet over your tomato patch on a chilly night, you’ll understand how Maggie McKenzie took that idea several steps further. If you’ve ever dreamed of becoming food self-sufficient, you’ll appreciate how Clair Schwan uses the hoop house concept to produce hundreds of pounds of produce. And if you want to see an actual working model, you can visit the hoop house in the backyard of the Children’s Village at the Cheyenne Botanic Gardens. Several other season-extending tools exist, such as cold frames, bottomless boxes with clear glass or plastic lids, and low tunnels. But a hoop house is high enough to walk in, giving it that greenhouse feel, and typically heated with nothing more than sunlight. Because hoop houses need to capture as many solar rays as possible, one long side faces south. Both Clair and the Children’s Village have shielded their north-facing lengths by locating their structures against existing windbreaks of trees or fences. –Tap short lengths of rebar into the ground at measured intervals on either side of the area you wish to cover. –Slip the end of a length of PVC over the rebar on one side, and slip the other end over the rebar on the opposite side. –Then do the next set and the next and, ta-dah! –now you have something that looks like the ribs of the top of a pioneer’s Conestoga wagon. That’s the basic method, but everyone does it differently. Maggie started out bending 4 x 16-foot cattle panels for her tomato plants to climb, and then in the fall, she added half-inch PVC ribs to extend the width when she decided to enclose the space. She figures she spent about $400 for her 10 x 13 structure, half of that for the glazing, or covering. The much larger structure at the Children’s Village, now under the management of Tyler Mason, assistant education director, was built last summer with 2-inch PVC pipes. Clair used chain-link fence top rail pipe, which requires simple equipment to bend each length into the same arc. Then there are purlins, boards that run the length of the hoop house–one on each side and one along the top, at a minimum—to keep the hoops stable. Plastic sheeting from the hardware store isn’t going to stand up to Wyoming wind, much less the ultra-violet rays we have at 6,000 feet. All three structures mentioned here use a translucent woven poly material treated for UV exposure. A little frost nipped, but plants are still alive after Arctic like temperatures. 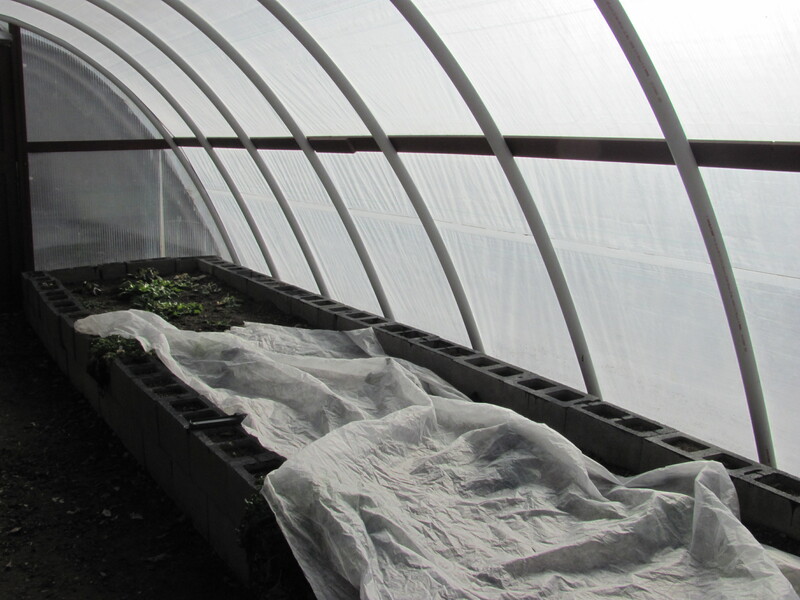 Inside the Children’s Village hoop house, 4-foot-wide raised beds on either side of a center aisle are outlined by stacked concrete blocks. Their upward-facing holes are filled with dirt, where Tyler expects to grow herbs. The south facing sides of the blocks are painted black to absorb more heat, warming the soil in the beds. Maggie’s tomato patch was already located on a double-wide raised bed delineated quite squarely with boards and help from her husband Don, an engineer by training. Clair too, has raised beds 2 feet high, made by stacking used power poles, although he needed to cover them so they didn’t leach poisonous wood preservatives. On cold nights and cloudy winter days, the plants inside appreciate being covered by a floating row cover, a light, white, polyester fabric frequently used by commercial growers, often to protect crops from insects, but which Tyler said can add 3 to 4 degrees of warmth. On March 1, Maggie’s “Little Hoop House on the Prairie,” was a toasty 70-plus degrees, while the outdoor temperature was 45 degrees, winds gusting to 45 mph. Being scientifically inclined—a biologist by training–Maggie has installed four probes recording maximum and minimum temperatures of the air and soil, inside and outside. The hoop house’s plastic skin has no insulation value to speak of. But a few simple tools can collect enough solar heat to keep the plants warm through the night. Maggie uses dark-colored, covered, 5-gallon buckets filled with water. Tyler also uses water, storing it in a 55-gallon black drum, along with a collection of water-filled pop bottles that release a little heat when they freeze at night. Clair is retrofitting his operation with solar-warmed water that will circulate in pipes underground. Hoop houses can get too hot and cook plants. “If it is 65 degrees and sunny, it can equal 90 degrees when solar rays are trapped,” Tyler said. The Children’s Village hoop house has plywood doors on either end. The top half of each can be opened for cross-ventilation. The bottom halves can be opened as well on very hot days, but Tyler warned that fencing needs to be set up to keep the rabbits out. Instead of burying the bottom edges of the plastic skin, Maggie has wrapped the lengthwise edges around PVC pipe cut to length. This way she can roll up the sides in the summer. The advantage is that the plants are aerated from a variety of wind directions, decreasing occurrence of fungal diseases. And bees and other insects can easily fly in and pollinate the fruit and vegetable blossoms. Eliot Coleman’s book, “Four-Season Harvest” explains how he manages his hoop houses in Maine, which lies in Zone 5, just like Cheyenne. In late summer he sows cold-hardy greens such as spinach, kale, chard and broccoli. By the time they are nearly mature, the weather is so cool and the day is so short, the growing nearly stops. The plants are in suspended animation, waiting to be harvested as needed. 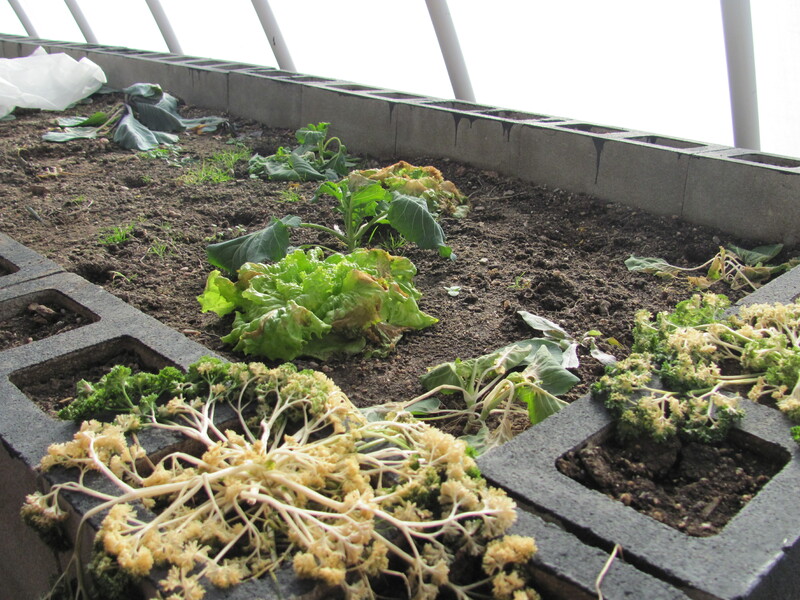 By late winter, early spring, there is room to get an early start on summer crops. Tyler plans a secondary use for the hoop house–harden off plants before putting them outside, besides raising vegetables to share with Children’s Village program participants. Both Tyler and Maggie experimented with growing spinach this winter. It was nice to see something green growing three weeks before winter’s end. I asked Maggie if she had the heart to pick her hard-won green leaves. “How can I harvest those brave little spinach plants when they’ve weathered such hardship and survived?” she asked. She might have been only half-joking. The Children’s Village hoop house can be toured when the Children’s Village is open. Contact Tyler Mason, 637-6349, tyler@botanic.org. Clair Schwan discusses his growing experience extensively on his website at http://www.frugal-living-freedom.com/build-your-own-greenhouse.html. Maggie McKenzie is a Laramie County Master Gardener. Contact her through the Laramie County Cooperative Extension, 633-4383. Two companies that carry the woven polyester sheeting recommended by interviewees are J & M Industries (Solarig High Tech Woven Plastic Sheeting), www.jm-ind.com, and Northern Greenhouse Sales, www.NorthernGreenhouse.com. 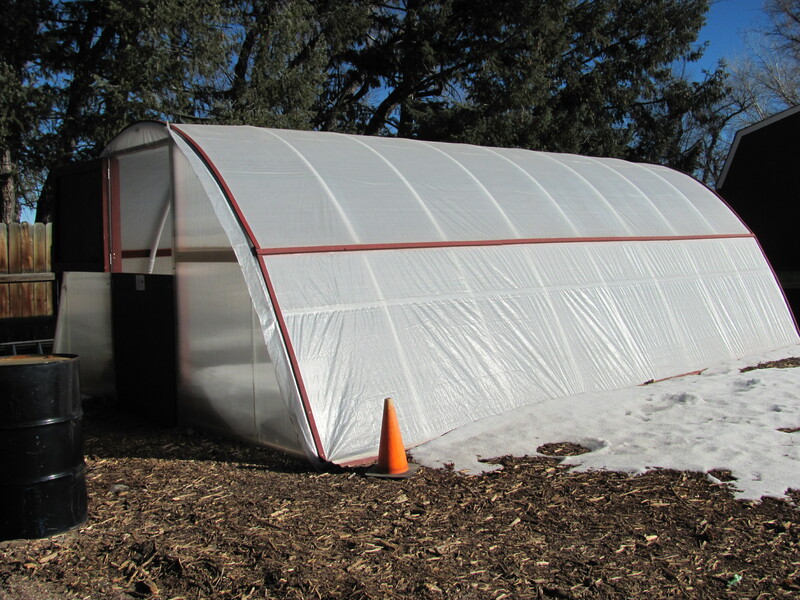 See the Wyoming Hoop House Info Network website at http://www.wyomingextension.org/whhin for building manuals, or contact University of Wyoming Cooperative Extension Service educator Jeff Edwards in Lingle, 307-837-2000, jedward4@uwyo.edu. If you are a farmer or market gardener interested in the Wyoming Department of Agriculture specialty crop season extension small grant program, contact Ted Craig, 777-6651, tcraig@state.wy.us. And, if you live within Cheyenne city limits, to be on the safe side, get in touch with the city’s building department before you start putting up your hoop house—depending on the size and scale, you may need a permit. The building department is located on the second floor of the Cheyenne municipal Building, 2101 O’Neil Ave. Call 637-6265. Categories: Hoop houses | Tags: Cheyenne Botanic Gardens, Clair Schwan, Eliot Coleman, hoop houses, Maggie McKenzie, Paul Smith Children's Village, season extension, Solarig, Tyler Mason, Wyoming Hoop House Info Network | Permalink.